The AGS 325 Narrowline double glazed aluminium framing system provides a crisp, narrow Commercial appearance in a smaller 76mm x 35mm form. 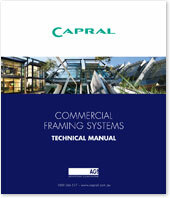 Its slimline frame depth and ability to accommodate a captive glazing wedge makes it an economical option for architectural housing, shop front applications of modest dimensions or internal partitioning applications. The centre glazed configuration can incorporate an adaptor to accommodate the 35 Series Awning/Casement window.